In one week I'll be seeing a grand daughter I haven't seen in over 6 years. She's a beautiful 14 year old now and I wanted to make something especially for her. I had to make it quick tho because I had so much going on and I had (only) 2 weeks to make it in. I can't wait to see her, but of course I was undecided on what she might like. I settled on a scarf ... made it a little on the wild-funky side and thought, "What if she doesn't like wild & funky?" So I made a conservative scarf ... to go with a black leather coat I saw her wearing in a picture. THEN I had more time to make something else. 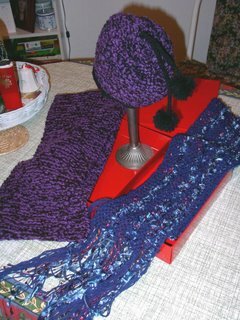 Why not a hat to go with the conservative scarf? Finished it yesterday. 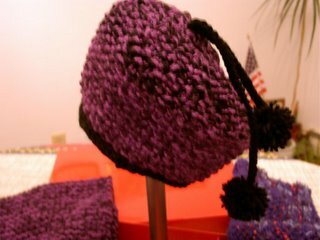 Maybe the hat's a little on the CUTE side rather than conservative ... pushing toward the funky, but I liked it so much I had to make it anyway. Well it remains to be seen if she likes any of them or will even wear them. I can only hope so, huh?! What do you think? What a nice nana -- making all these handknitted gift for your granchildren! I hope she treasure it and wears it.